If you love strategy games and have a thing for engineering (like me), then this game is for you! The concept of “Cargo Bridge” is quite simple. You are give the tools to build a bridge so your workers can cross from one side of the screen to another so they can bring back some goods to your base. As each level passes, the challenges grow increasingly harder. In addition to the tools provided (walk ways and support pieces), you have a dollar limit that restricts how complex your bridges can become. Your score is based upon how much money you have remaining after each level. My current score is currently $7,612 to date after 20 levels. Some of the challenges have taken a day or two to solve, so don’t be fooled by how easy the first few levels seem. If you are up to the challenge, visit the Physics Games website and get building! There has been a big change over the past two weeks, and I’m not sure what is the cause. 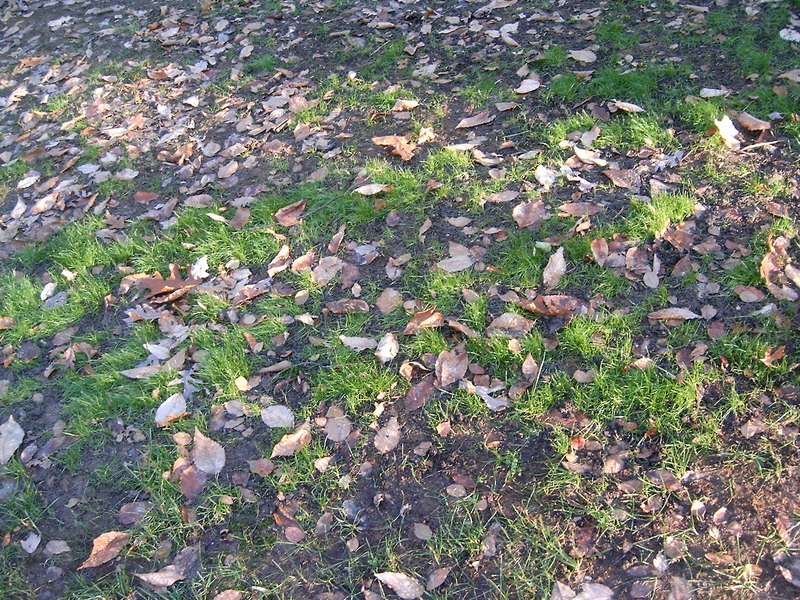 As I noted in the beginning of November, it looked like the Smart Patch grass section might have started to die off. Well, as you can see below, the new grass has thinned out. Obviously, the falling leaves might have something to do with this. With the amount of leaves that are falling, a fresh blanket covers the yard each week before I have a chance to clear them away. If you compare the Smart Patch section to the Turf Builder section, however, you’ll note how poorly the Smart Patch grass is looking. The Turf Builder section continues to grow in, creating a thicker carpet of grass. If the grass looks anywhere close to this now next Spring, I am leaning towards using this product to repair my whole yard. Of course, that means I will also be using the Scotts Seeding Soil as well, since the test sections combining the two products have performed the best. The big question to address will be the cost. Is it cheaper to buy the soil and seed, or is it cheaper to buy sod? E.T. phoned home. Why can’t the troops? Why don’t you lend our troops fighting in the Middle East a hand by donating phone cards to them this holiday season. While you are home with your families and friends, our troops are separated by thousands of miles from theirs. A phone call home on Christmas Day might make a world of difference to them. The USO and AAFES organizations are coordinating efforts for you to donate funds to this worthy cause. Just visit their websites and follow the instructions. There is no limit to how much you can donate. Give the gift of happiness and love this year. Donate a phone card to our Troops this holiday season. Today is Veterans Day, the day we set aside to remember the end of World War I (Armistice Day) as well as all the brave men and women who put their lives on the line to defend our nation and liberty around the world. Many television stations and news channels ran special programming today to mark the holiday. One channel was running the old series “Victory at Sea ” in honor of today. If you have never heard of “Victory at Sea,” I must say you are missing out. Aired in 1952, the series pieced together hours of war footage from World War II filmed by those Allies and Axis nations alike. While the series focused on the US Navy primarily, it also aired footage of land and air battles as well. One of my favorite pieces was the “Design for Peace” episode. For over 10 minutes, a montage of “welcome home” scenes are pieced together, showing sailors pulling into port and being greeted by their wives and loved ones. It continues with the parade of forces from all branches from all countries. As the video jumps from nation to nation, the orchestra soundtrack changes to match the music style from the nation being presented. The series is currently for sale, but is also shown on television from time to time. Some of the series can even be found on YouTube, such as the segment below. As you will experience with this clip, the producers did a fantastic job of weaving video, audio, instrumental, and narrative together into a perfect presentation that draws in the viewer and places them in the scenes. This craftsmanship is what led the series to win an Emmy in 1954. As you watch, remember the men and women who sacrificed themselves in defense of liberty. Many gave some … some gave all. Remember this, on this Veterans Day as well as every day of the year. Fall is settling in, and the battle of the leaves continues. 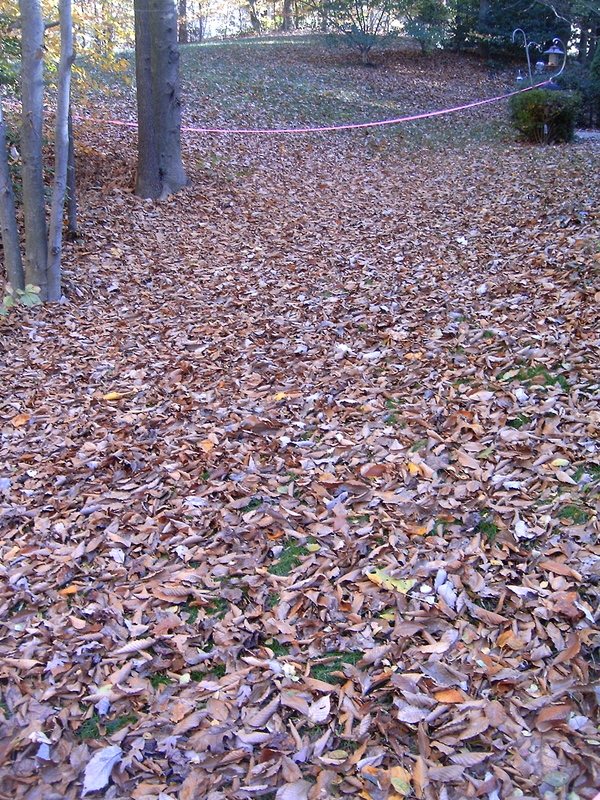 Seems as soon as I clear the leaves and go inside, the lawn is covered all over again. Just a few more weeks……. After some raking and leaf blowing, the new grass was uncovered. The Smart Patch section (below) continues to grow strong. Actually, the blades of grass are so long that they are laying down like a green shag rug compliments to the weight of the fallen leaves. 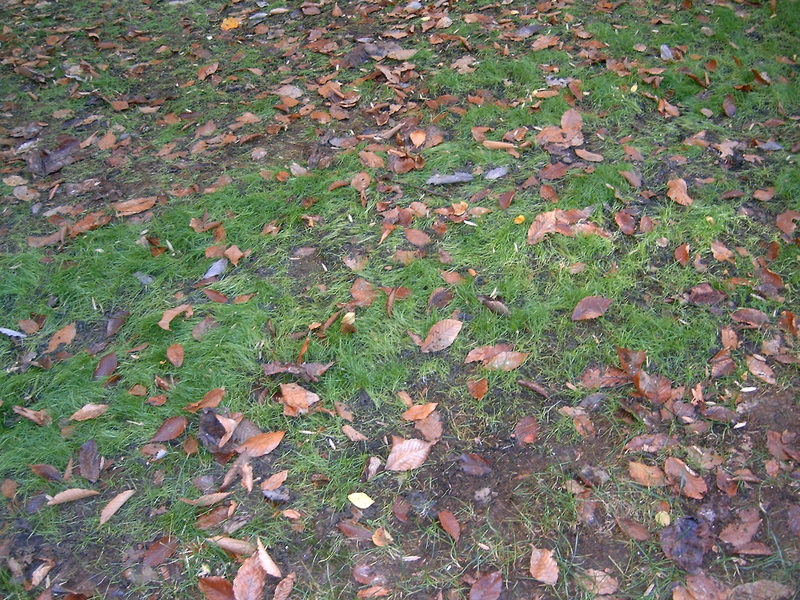 It does look like some of the new grass might have died due to the amount of leaves that came down, so I’ll have to keep track of it. 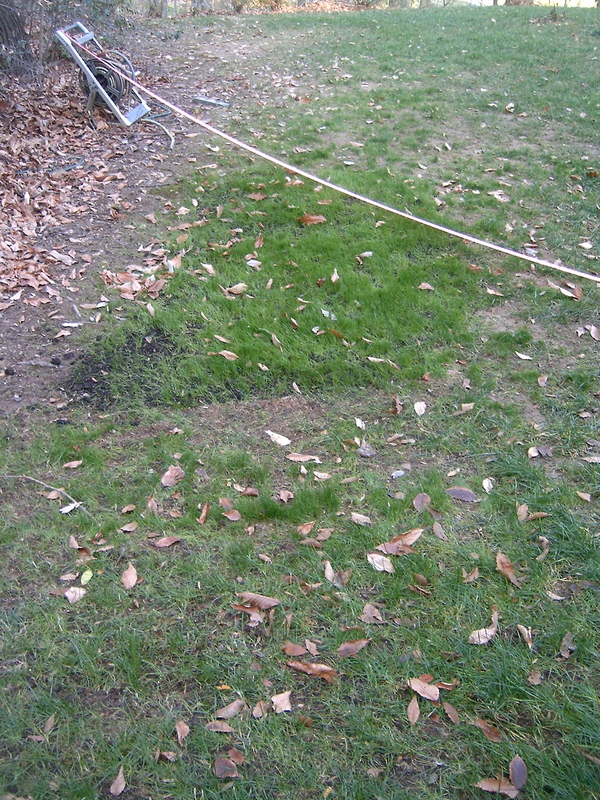 The Turf Builder grass, on the other hand, really took off since the last pictures … especially in the areas where I put down fresh soil. As you can see in the picture below, the section in the top-half of the picture has come in thick. 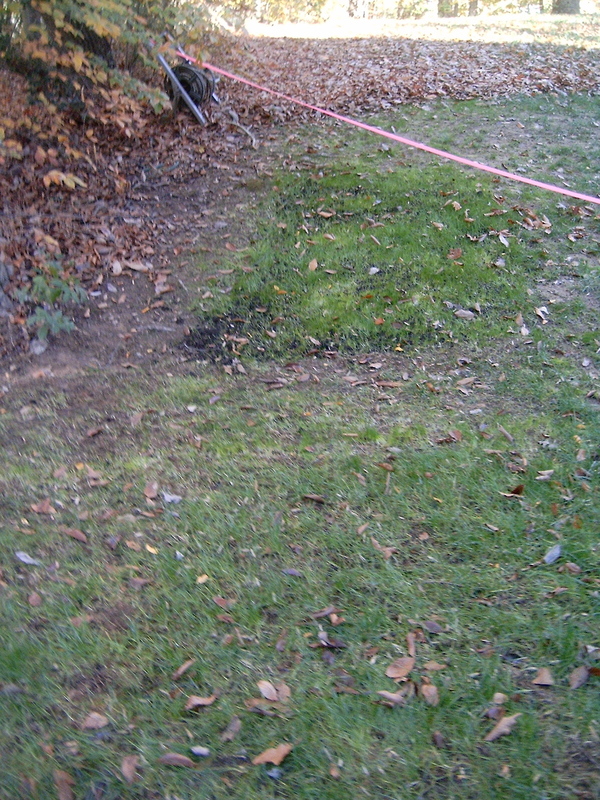 In the lower half of the picture, new seedlings are popping up in the existing grassy areas, but not to the level of the Smart Patch. More pictures to come in about two weeks. You are currently browsing the MODU's Musings blog archives for November, 2009.